You are NOT walking the dog. Sound crazy? Here’s how it works: YOU are going for a nice walk. Out of the goodness of your heart, you’re taking Rover along with you. You are not doing this for them and it’s not their walk, it’s YOURS. (Actually it IS for them but Shhh.. Don’t tell your dog!). You decide where to go, at what speed, and when you want to stop. The dog doesn’t get to dictate it to you by pulling or dragging etc. You control the walk. OK? A walk in the park should not look like a walk in the park! Instead, you should walk with a purpose: Walk at your own speed, but with head up and as though you know exactly where you are going. (Even if you don’t!). Would you follow someone who looks aimless? Dogs rarely do! If you want them to follow your lead, rather than try to pull you around, first you must LOOK like a leader. You’ll be amazed at the effect it has. You don’t have to let your dog say hello to every dog. You don’t stop and talk to every person, do you? Why would your dog get to say hello to every other dog they see? Some, like people, just don’t want to be sociable today, thank you. If you decide to walk past, then walk past. That’s OK. If you want to stop, stop. It’s your call. You’re the one in charge! Don’t spend a fortune on a special dog training collar or dog lead. I’ve known people to get through over £100 worth of dog collars and dog leads to no avail before they called me. I normally use very simple equipment in my dog training. It’s HOW you use it that counts. 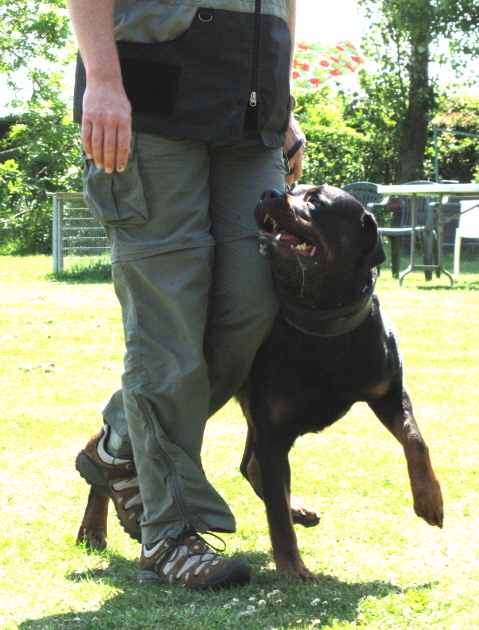 If you do need something different, I can advise what’s best for you and your dog. If you’re having problems with your dog walking and it’s not a pleasure anymore, don’t call in the osteopath just yet, call a professional dog trainer instead. 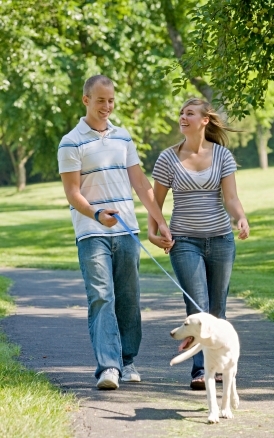 In no time at all you could be enjoying your dog walk so much more. Like most things in life, walking a dog is much easier when you know how.